Horrendous conditions didn’t stop the team at the Brookby Showjumping Grand Prix Show, and their efforts didn’t go unnoticed. Dunstan Horsefeeds and EquiFibre Horse Grand Prix winner Lisa Cubitt (Cambridge) said the committee had done an incredible job in very difficult conditions. “It was probably the wettest I have ever ridden in,” she said. But it didn’t stop her taking a solid win aboard her new mount Matawai Sentana (owned by Jacqui Wright). Cubitt has had the ride just three weeks, and now have four starts under the girth – wins in the 1.2m and 1.4m and a third in the grand prix at Woodhill Sands the previous weekend, and now victory at Brookby. “He is a lovely, scopey, brave and careful horse,” she says. However, he doesn’t like to hang around the warm-up ring too much – which was just as well, because on Sunday Cubitt had been judging the five-year-old style prize and had to run to the main arena to make a call on whether she was going to start or not. That decision made, she headed back to the truck and got on the horse. She didn’t even walk the course. The Philippa Howells-designed course challenged the 10 starters, and Cubitt and the 10-year-old grey gelding – who is by Senator VDL and out of Kiwi Classic (by Kiwi Gold) – were the only combination clear in the opening round. Runner-up Elmo Jackson (Auckland) aboard Dr Feel Good and third-placed Emily Hayward (Te Awamutu) on AP Ninja had four faults apiece. Cubitt was rapt to see the warmblood step up, having just waved goodbye to Cobra De Capello who she had huge admiration for. The horse is now in Victoria, Australia. Just seven started the Country TV Pony Grand Prix at Brookby where the winner Jayden Horsfall (Bay of Islands) and My Dream Catcher rode off with the win after a four fault opening round. Second-placed Brooke Hawthorne (Cambridge) and Easy As were second on eight faults. Dunstan Horsefeeds and EquiFibre Horse Grand Prix: Lisa Cubitt (Tamahere) Matawai Sentana 1, Elmo Jackson (Auckland) Dr Feel Good 2, Emily Hayward (Te Awamutu) AP Ninja 3, Glen Beal (Pukekohe) All Expenses of Renton 4, Olivia Dalton (Karaka) Appleton 5, Tom Tarver-Priebe (Kawerau) Popeye 6. Country TV Pony Grand Prix: Jayden Horsfall (Bay of Islands) My Dream Catcher 1, Brooke Hawthorne (Cambridge) Easy As 2, Tyla Hackett (Waiuku) The Dreamer 3, Nayton Mitchell (Otaki) Chocolat Sucre 4, Crystal Hackett (Waiuku) Cracklin Rose 5, Ciel Butler (Katikati) Showtym Boss 6. Purepine Shavings Seven-Year-Old Series: Catherine Cameron (Cambridge) Kingslea Couture 1, Catherine Cameron (Cambridge) Charlton Bazaar 2, Sarah Worker (Auckland) Remarkable 3. Mitavite Six-Year-Old Series: Annabel Francis (North Canterbury) Catapult Xtreme and Rosie Commons (Auckland) Lotte =1. East Coast Performance Horses Five-Year-Old Series: Sam Kensington (Auckland) Waitangi Firefox and William Willis (Karaka) Chio MS =1. FMG Young Rider Series: Emily Hayward (Te Awamutu) Yandoo Lady Gold 1, Elmo Jackson (Auckland) Next 2, Olivia Dalton (Karaka) Appleton 3, Bryony Smith (Kumeu) Ngahiwi Warrior 4, Lily Tootill (Karaka) Mosaic II 5, Oliver Croucher (Rotorua) Waitangi Surf 6. Dunstan Horsefeeds and EquiFibre Junior Rider Series: Emma Watson (Morrinsville) Maddox Kiwi Silverkee 1, Jessica Collinson (Clevedon) Bunny Hop 2, Samantha Maguire (Te Kohanga) Starlight Daytona 3, Olivia Dalton (Karaka) Master of Hossack 4, Olivia Dalton (Karaka) Bling du Rouet 5, Maia Coster (Tauranga) Clearwater 6. Dunstan Horsefeeds and EquiFibre Pro Am Rider: India Causebrook (Pukekohe) Westminster Rock 1, Laura Pratt (Hamilton) Just Jess 2, Karen Riddle (Rotorua) LC Talent 3, Rosie Commons (Auckland) Althena GNZ 4, Christine Cornege (Cambridge) Varekai SL 5, Rebecca Roigard (Auckland) Gazelle 6. 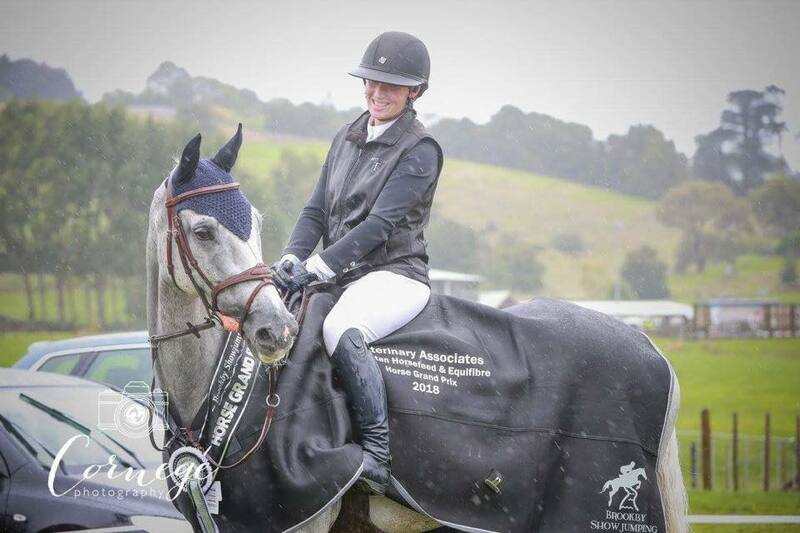 Caledonian Holdings Amateur Rider Series: Kelsey Leahy (Cambridge) Showcause 1, Tessa Ranger (Tamahere) Alezan Chablis 2, Tim Featherston (Kerikeri) Kiwi Supakee 3, Lacy Kamm (Auckland) Eisenhower 4, Kylee McCambridge (Cambridge) Chicago 5, Amanda Illston (Auckland) Verdelho 6.